A summer salad that makes a great packed lunch or side with a main meal. This recipe is perfect for bringing in a lunch box to school, work, or on the go. Filled with excellent sources of healthy, slow-releasing energy sources, it is perfect for a post-workout meal, or lighter lunch. 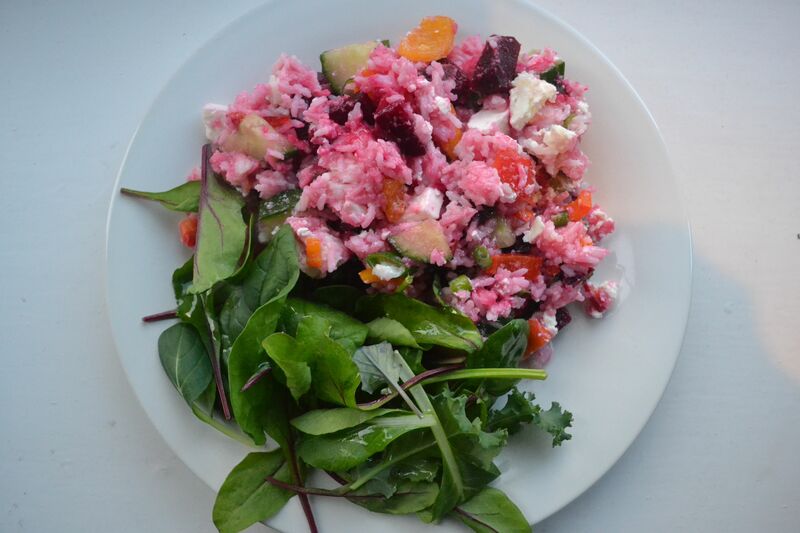 – 5 chopped spring onions – 7 small sweet bite peppers – 200g feta – half a cucumber, chopped – 2 tablespoons of olive oil – pinch of salt – 2 big cups of white rice – 3 small packaged cooked beetroots, chopped – 2 fresh chilis finely chopped. 1. Boil a large volume of water in a large saucepan, until cooked. 2. While cooking, the vegetables can be prepared and chopped. 3. When the rice is ready, drain the water and transfer into a large mixing bowl. Add the vegetables and crumble the feta into the salad, mixing well. 4. add salt to season and serve alongside a leafy salad. Have you tried this recipe or have any tips of your own? Comment below to add your thoughts! Don’t forget to tag us in your recreations on Facebook! Sign up for news and competitions!